==> In a hurry to check out mini mixers? Click here!! 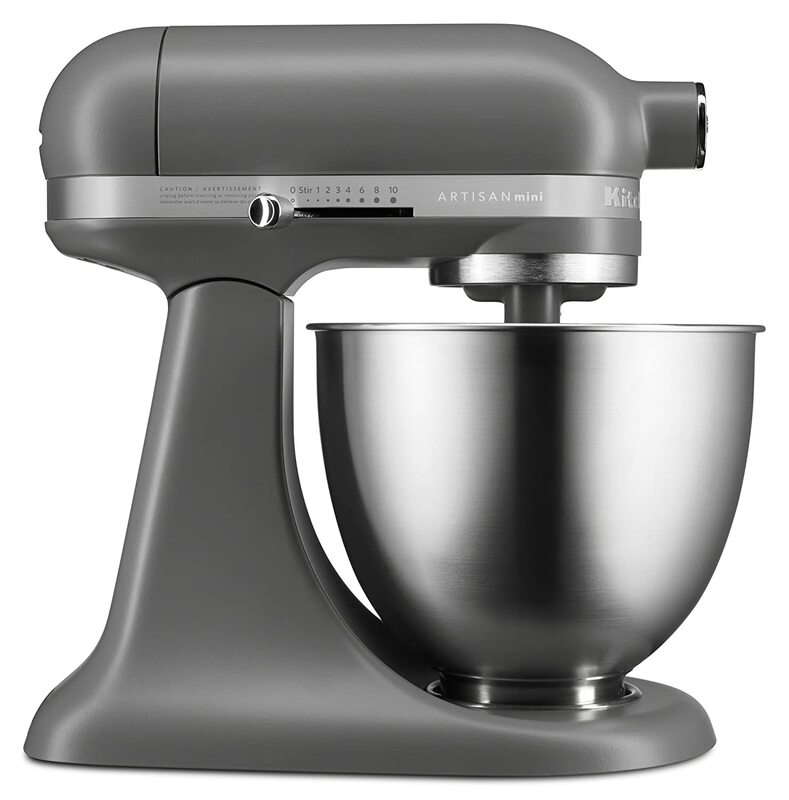 KitchenAid Artisan Mini Stand Mixer in Matte Gray! 0.1 ==> In a hurry to check out mini mixers? Click here!! 1 KitchenAid Artisan Mini Stand Mixer in Matte Gray! 1.3.1 Deal #1: Gray Artisan Mini Mixer, bowl, plus 3 types of beaters. 1.3.2 Deal #2. Gray Mini Mixer, steel bowl and Flex-Edge beater. 1.4 Check out this video about the new Mini Artisan Mixers! Whether you spell it “gray” or “grey”, this is a great stand mixer! 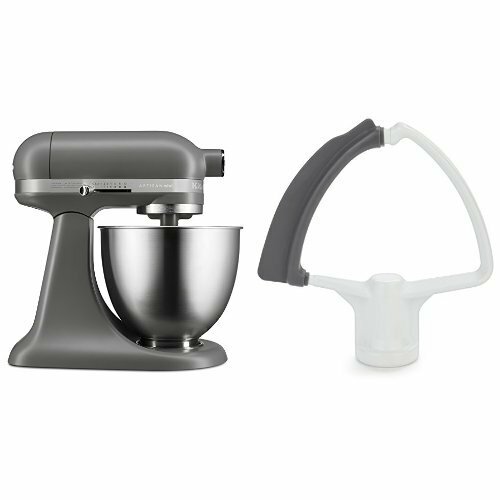 The Artisan Mini mixers are new in 2016, and the Matte Gray Mini Tilt-Head Stand Mixer is a wonderful addition to the KitchenAid series of mixers. This small Kitchenaid mixer, the Artisan Mini, is one of the best stand mixers for the small kitchen. Not only does it weigh the least amount of any of the KitchenAid stand mixers, but it also has smaller dimensions. Because of the smaller measurements, it’s easier to find space for it on your kitchen counter. If you’ve had trouble fitting a small appliance underneath the cupboards over your counter, this fact the mini is 2-inches shorter than the other mixers could make all the difference. With this classy gray shade, this mixer will look good in about any color kitchen. Of course good looks are just the start of what makes this Artisan mini a great stand mixer! Gray and black are both rather neutral colors, in the same color family. So you might not be sure which one you like better. Here’s pictures of the two different colored mixers side by side to help you compare how they look. If you’re trying to choose between the two, maybe that will help! As far as the matte finish goes, it’s comparable to a flat finish for paint. You know how when choosing paint for your walls, you can choose between satin and flat finishes? Well, matte is more like the flat finish, not shiny like satin. This grey mini mixer would look fine in any kitchen painted in just one color. It would look especially nice in a kitchen with blues or pastels. But as I’m sure you know, gray will blend with just about any color, so if you like this hue, go for it! ==> Want to see best prices on mini mixers? You can usually find them HERE!! Oh, and a matte gray mixer works well in kitchens that have patterns, like one with wallpaper or even a patterned wall board. If all this talk about figuring out the best color mixer for your kitchen seems crazy, hey! Look at this way… you’re going to get a great, utilitarian mixer no matter what shade you buy. But it comes in 10 different colors, so why not pick one that you like and will look snazzy in YOUR kitchen? You can use a gray mixer in just about any color kitchen, so the main question is, “Do YOU like it?” If this color doesn’t make you happy, there are 9 other colors to choose from! And of course while getting a lovely color mixer is a nice bonus, the main reason to buy a KitchenAid Artisan Mini is because it does such a great job. Considering this smaller mixer has the same motor size as the next-size-up Classic Kitchenaid mixer, you can be sure it still has plenty of power, it’s a good buy in a smaller sized package. And that smaller size makes it a lot easier to move around than the bigger mixers, and can fit in smaller places as well. You can buy a couple of different bundles that include the gray Kitchenaid Mini mixer. Both sets start with the gray matte mixer, but each deal has different accessories. Deal #1: Gray Artisan Mini Mixer, bowl, plus 3 types of beaters. This package deal for the gray matte shade of mini mixer is shown on the left side in 2 pictures below. Along with this small Kitchenaid mixer you get three attachments: the flat beater, dough hook and wire whip. (I’m not sure whether they should be called attachments or accessories…. but these fit in the beater insert, NOT something that fits in the hub). ==> Get deal #1 with the 3 types of beaters by clicking here! Note that the beaters for a mini Artisan fit only that model. Most models of KitchenAid mixers have their own size of beaters because the space between the head of the mixer and the bottom of the mixing bowl varies from mixer to mixer. If you try to use the wrong size beaters, they won’t do a good job. And if they are too big, they could dent the mixing bowl, or damage the mixer. Oh, and as to the mixing bowl! You get a 3.5-Qt. Brushed Stainless Steel Bowl with this package. It does NOT have a handle, just smooth sides. If you are looking for the best priced deal, this mixer, bowl and 3 beaters generally costs less than other bundles. Deal #2. Gray Mini Mixer, steel bowl and Flex-Edge beater. This is the mixer shown above on the right. With this deal you get the Gray Matte Mini Mixer, bowl, and a Flex Edge beater. This is a special beater with flexible edging along one side. The edging works like a rubber spatula, and scrapes ingredients away from the sides of the bowl as the beater moves around. You can buy this kind of beater separately for some KitchenAid stand mixer models, and it usually costs around forty dollars. ==> Get deal #2 with Flex Edge beater by clicking here! The mixing bowl is the same brushed stainless steel as the first deal, and holds about 3 1/2 quarts. .If you like the Matte Gray color, either one of these packages includes the mixer that would be a workhorse in your kitchen. It’s just a matter of which accessories you would prefer: the flex edged beater, or the combo of 3 beaters: flat, dough hook and wire whip. Consider This: A KitchenAid Artisan mini mixer is an investment in excellent equipment for your kitchen. This is a reliable, well known brand. This model has the same motor as the Classic, giving it ample power to run beaters or attachments on the hub. There are 10 mixing speeds so there’s bound to be one just right for whatever mixing task you have. And you can extend the use of your grey Artisan mini mixer by adding other attachments like a pasta maker or grater. So if you want a gray Artisan mini mixer that looks elegant and works great, pick one of the deals above and get yours today! ==> Find out more about the KitchenAid Artisan Series Mini Mixers by clicking HERE. Check out this video about the new Mini Artisan Mixers! This video has demonstrations on using the Artisan mini mixer. Granted, she is working with a Hot Sauce Red Mini Mixer, but the color doesn’t matter. All 10 shades work the same way, and will do all the same things. Also, if you would like to read a more extensive review of the Artisan Mini Stand Mixer, check out our review on this model here.